As frequent flyers on this site will be aware, Burghwallis Parish Council take great pride in maintaining a tidy village. To this end, we have been pressing DMBC for more litter bins for some time. Now a new one has appeared, at the eastern end of Grange Lane, near the junction with The Abbe’s Walk. This new beauty is twice the size of our other bins. Maybe the DMBC are aware of our constant litter problems! 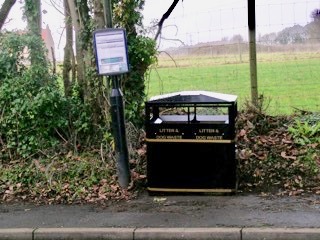 We are still hopeful that we will soon have another bin on Grange Lane opposite Scorcher Hills Lane, adjacent to the top of Stony Croft Lane. And now some interesting news for dog owners. Providing you scoop your dog’s deposits into a plastic bag you can now deposit the bag into any litter bin (rather than looking for a ‘dog poo’ red bin). You will see our new bin says “Litter and Dog Waste” No need to toss the bag into a hedgerow or hang it on a tree branch or fence – just in case you were tempted before.